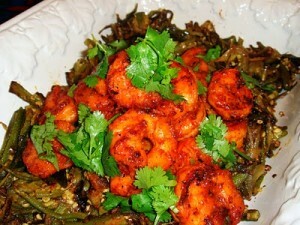 Tandoori Jhinga (Prawns) recipe by Nazia Nazar at PakiRecipes.com. Shell, devein and clean the prawns. Mix all the ingredients except the butter to make a marinade. Put the prawns in the marinade covering them all over. Put the marinade without the prawns into the butter. Stir and fry for a few minutes until the butter seperates then gently put the prawns into the frying pan and stir carefully. Cook for a few minutes till the prawns are ready.